I used to dream about having a fireplace with a mantel so that I could decorate it for holidays. Now that I have one it has proven to be quite difficult for me to actually come up with decor ideas. Some people are really good at styling mantels, I am not one of those. Please teach me your ways people! 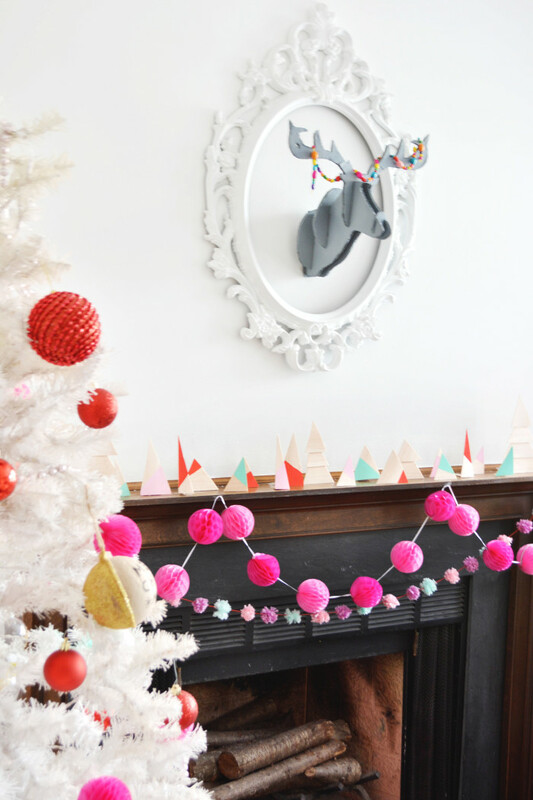 This year all I wanted was a bunch of bottle-brush trees and I did try to make my own yarn ones but they were too time consuming to be realistic (says the woman who spent 6 hours making that pom-pom garland ha). So after that attempt I brought out my trusty balsa wood and fashioned a whole forest of colored trees and it took maybe an hour and was much cheaper than buying 15 trees! See all the fun angles and colors you can use? I was limited in width by the size of the balsa board I had so I also just went ahead and made a few trees from multiple triangles that you can see above. 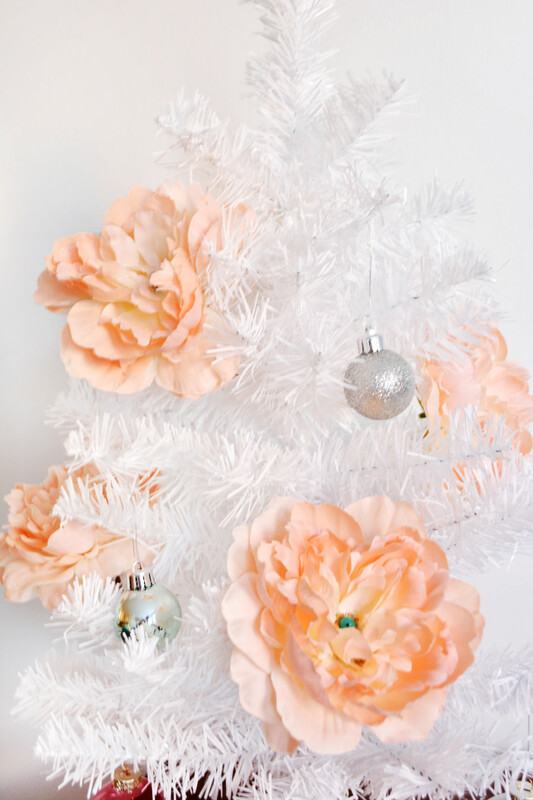 You probably don’t need directions on these little trees, but click through for the super simple how-to just in case! We are beyond thrilled to participate in another awesome DIY blogger swap! Remember last time we got the most amazing desk caddy from Christina Williams? Wait until you see what ridiculously creative ornament we got this time around! You will die. First though I guess I should show you what we sent to our lovely swap partner, The Sweetest Occasion! You know those wonderful yarn wall hangings that have been all the rage lately? Well, Machelle and I were discussing making mini versions of them for a necklace (which would still be amazing to do wink, wink) but once we got this ornament blogger swap going I thought that the idea would also translate nicely into ornaments. I also had less traditional yarn colors available so if you want them to be extra festive feel free to grab the perfect shade or red and some gorgeous greens for these mini hangings! 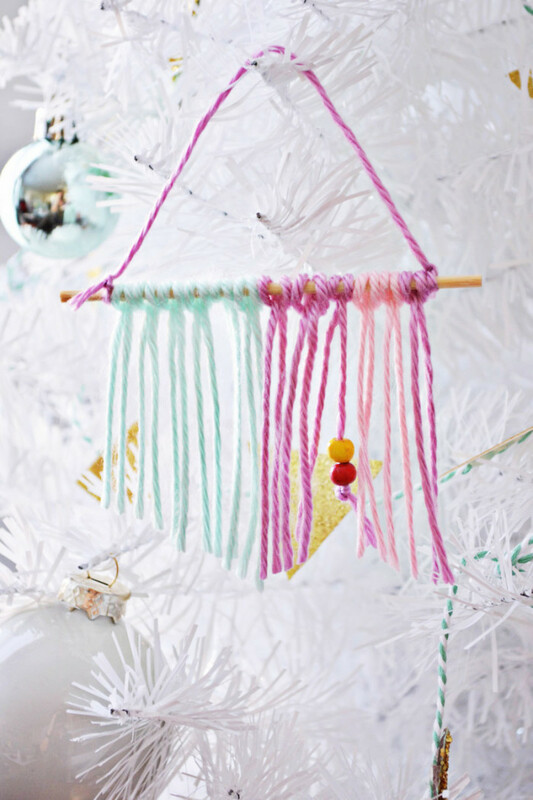 Click through to see the how to for this yarn ornament and all the rest of the amazing bloggers involved but first check out the AHMAZING ornaments we got from our girls at J.Sorelle Blog! It’s a geronimo balloon! Are you kidding me?!! I’m so absolutely in love with these, I definitely think we won the swap! What a cute idea! To see how to make some of your own, head right here! So I don’t have a fireplace. This is sad to me for a number a reasons, all the charming decor you can do around them, the instant warmth they seem to add to a room even if there’s no fire crackling within. But mostly, I don’t think about it much until Christmas rolls around. Then I feel like my home is missing a necessary appendage. I mean, where will we hang the stockings and more importantly how on earth will Santa get in to leave us our gifts?! Because I need me some gifts and also because I love hung stockings for the weeks leading up to Christmas, I decided to take care of this problem with some hand DIYing this year. I’ve seen some really fabulous chalkboard fireplaces, cardboard fireplaces and even flat out fake-but-look-just-like-the-real-thing wood built fireplaces but I wanted something even less permanent and especially less work than all of those options. So I made one to print out instead! Here in the U.S. peony season is over :( I am beyond obsessed with these large, petal-filled flowers so when I stop seeing beautiful ones at the farmer’s market it’s really a loss. But these fake ones aren’t half bad so I nabbed a few at the store the other day. I’m in full on Christmas mode though so these couldn’t just be displayed, oh no! I needed to make them festive! The perfect solution was these simple ornaments. They fill out my tiny side table tree perfectly but a large tree filled with them would be to die for too! If you’re looking for an easy way to decorate your tree with big impact that won’t cost you a fortune, this is the answer! We decked ours out a little with glitter and beads but you can even skip that step for something as easy as cut and stick! Really, what could be easier? And at this time of year don’t we all need a little ridiculously easy-ness?? Click the Continue Reading button to see just how we accomplished this look and more pictures! 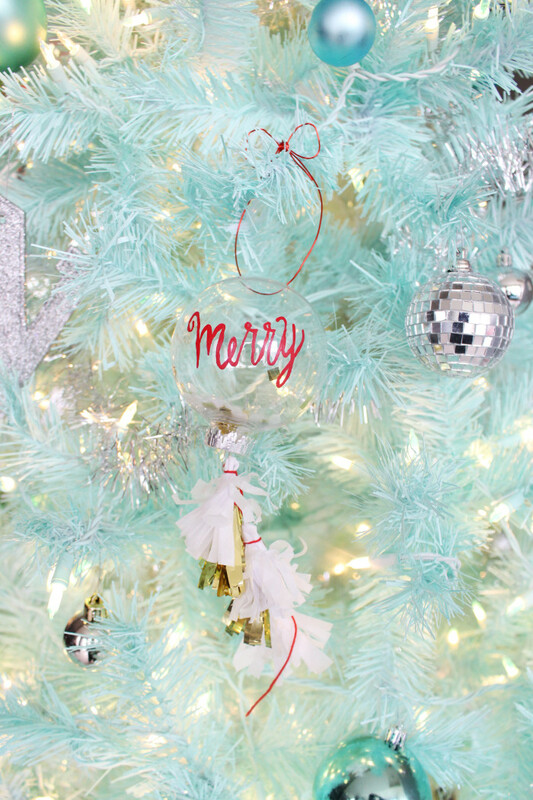 I always love colorful holiday decor! 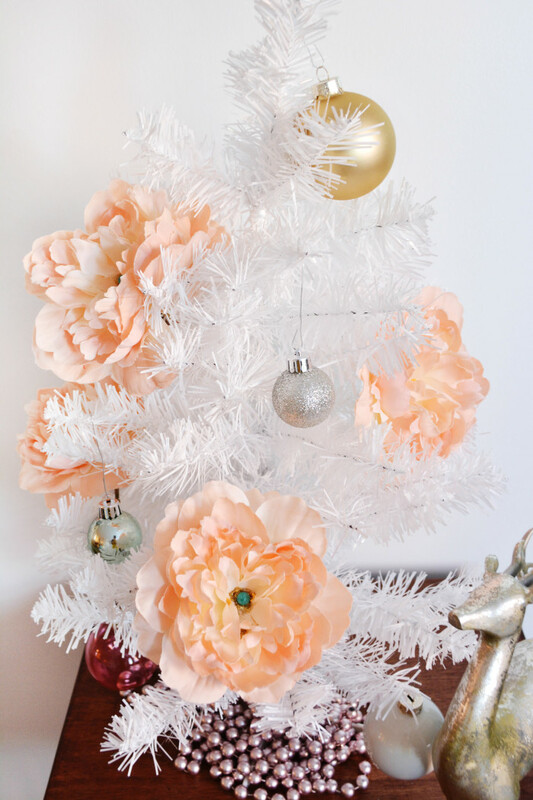 I am currently conflicted between bright Christmas trees with almost every color and just having a more rustic feel with red, black, white and copper. Today I am swinging toward bright everything! 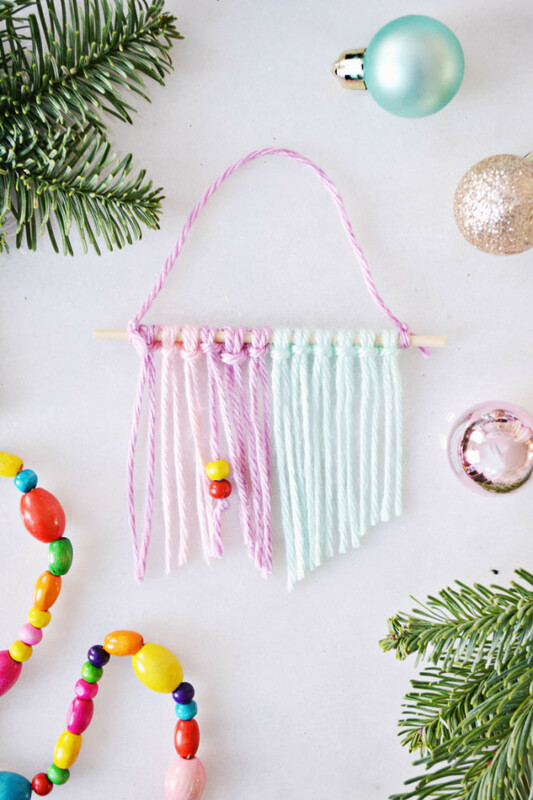 The last two years or so colorful felted ball garlands have been really popular. 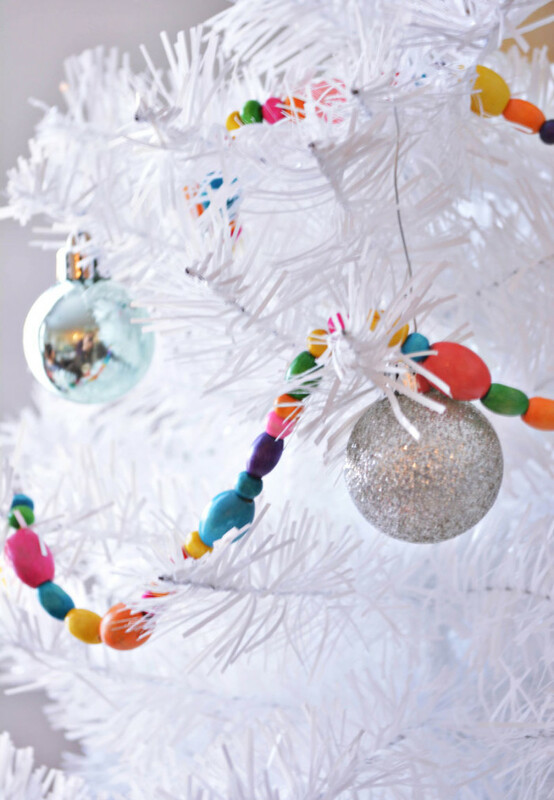 And I adore those of course but this beaded garland makes for a great and easier (I think) alternative! So read ahead for one of the easiest DIY projects we have featured. 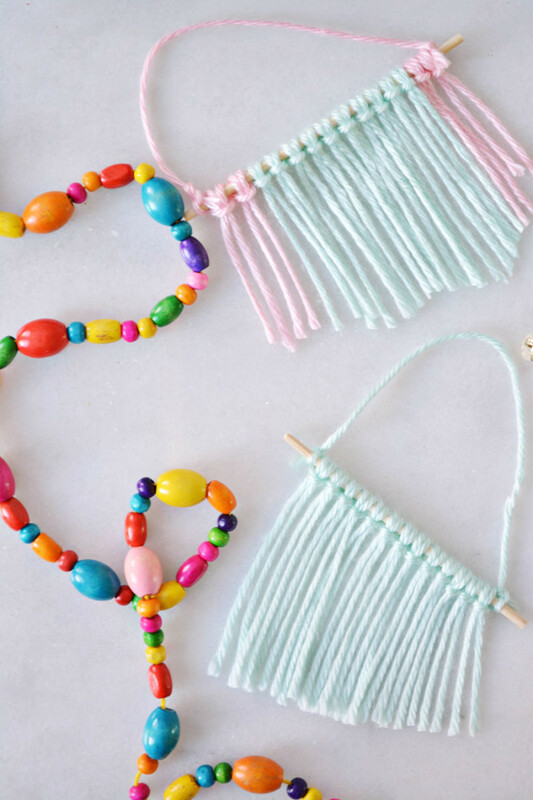 And after Christmas, you can use the garland to make bracelets and necklaces. Or save it for next year! I started with these awesome wooded beads from PandaHall (find them here). They come in a bunch of different shapes and sizes and I used 3 different sizes of beads for this tree garland.